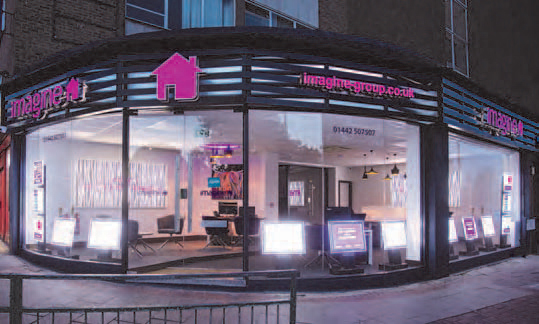 In early 2017 the Imagine Group commissioned OAD to design, build and deliver their fourth high street location in the centre of Hemel Hempstead in a tight five week schedule. The brief was to create an eye catching office that stood out and was like no other estate agent office on the high street. With the use of bright LED glass wall art panels and zebra wood laminated LED window poster units it was an office you could not fail to notice. The cased chrome fascia signage framed the office perfectly.